These are magic cookies. Maybe not as cool as the way sugar turns to liquid when you heat it up, but still pretty cool. This is actually the second time I’ve attempted to make them. The first time I messed up, or so I thought. Turns out, I just didn’t believe the final step, the magic step. What is so cool, you ask? Well, once the batter is made it is really liquidy. If you scooped it onto a cookie sheet it would just expand and spread out over your whole sheet. This is what I noticed the first time I made them, so I just turned them into brownies (which were quite delicious). There is, however, a crucial step in the process that I had skipped. 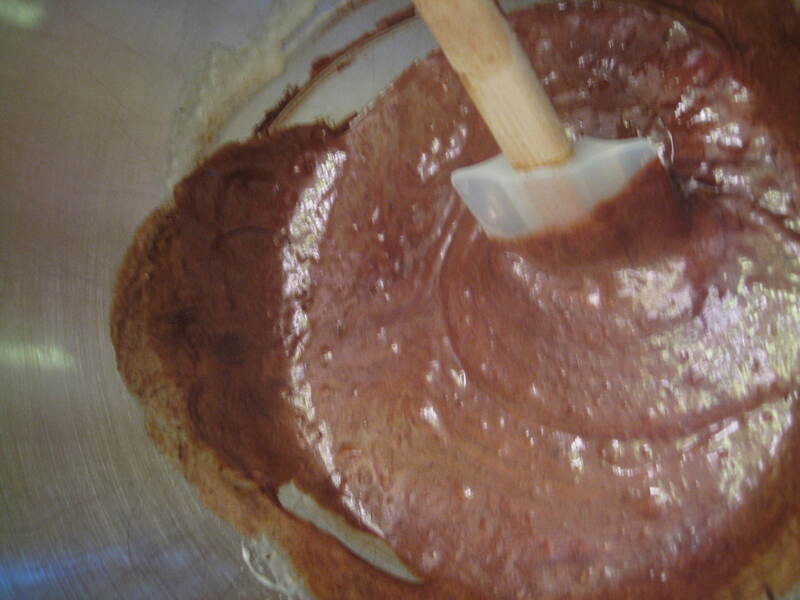 After the batter is made, you let it sit for 15 MINUTES. 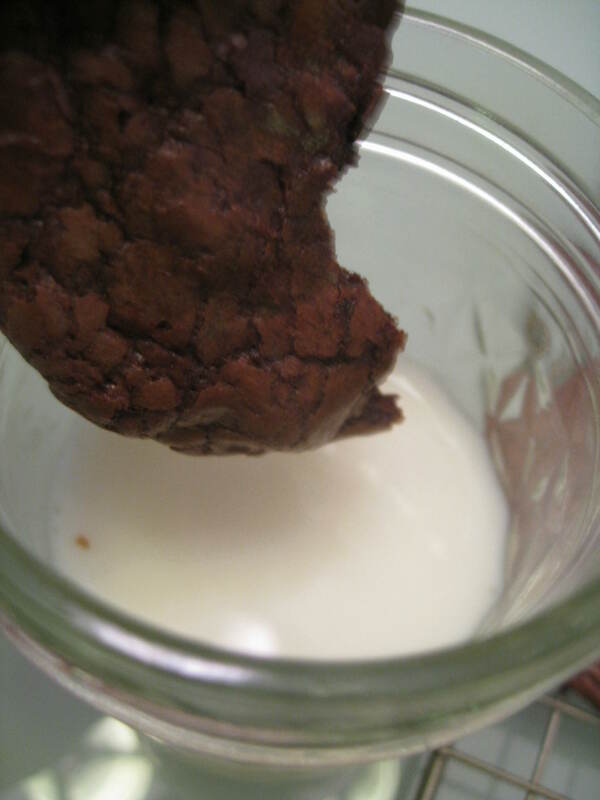 The batter goes from a liquid to a solid (well not solid solid, but cookie dough solid). I don’t know the chemistry behind it… maybe one of my science friends or a friend who has gone to culinary school might know, but for now, I’ll just call it magic. My friend Erin’s mom sent me this recipe and said it was THE CHOCOLATE COOKIE. Just awesome. Well, I completely agree that it is an awesome cookie, and everyone at lunch concurred. 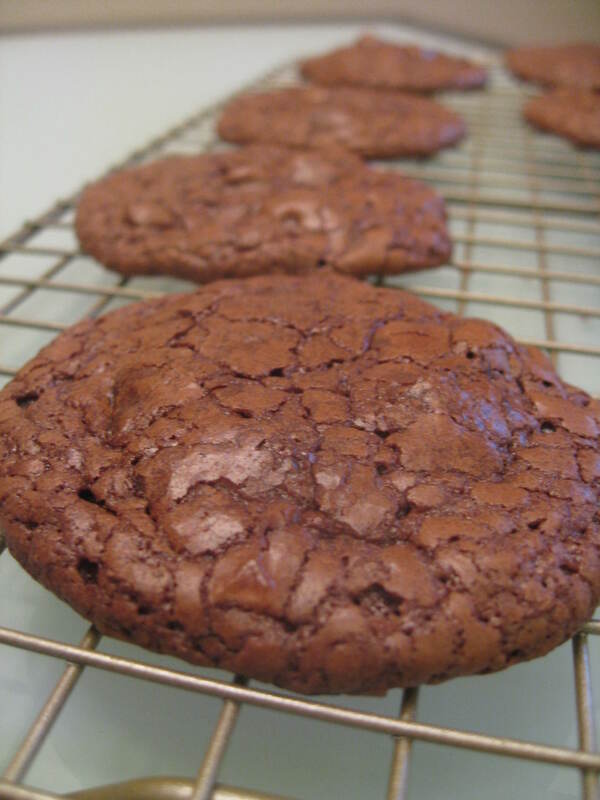 I am, however, still partial to the dark chocolate cookies with little salt on top (given to me by Erin – no wonder I like their family), but these are definitely pretty high up on the list of chocolate cookies, and they are nice with the hint of expresso in them. Because these are a little more involved than your typical cookie, I am going to walk you through the steps of making them. 1st: Set your eggs out an hour or so before you want to begin baking so that they will reach room temperature. Melt unsweetened chocolate, 1/2 of the chocolate chips, and the butter by putting them in a microwave safe bowl and heating them in the microwave for 30 seconds at a time. 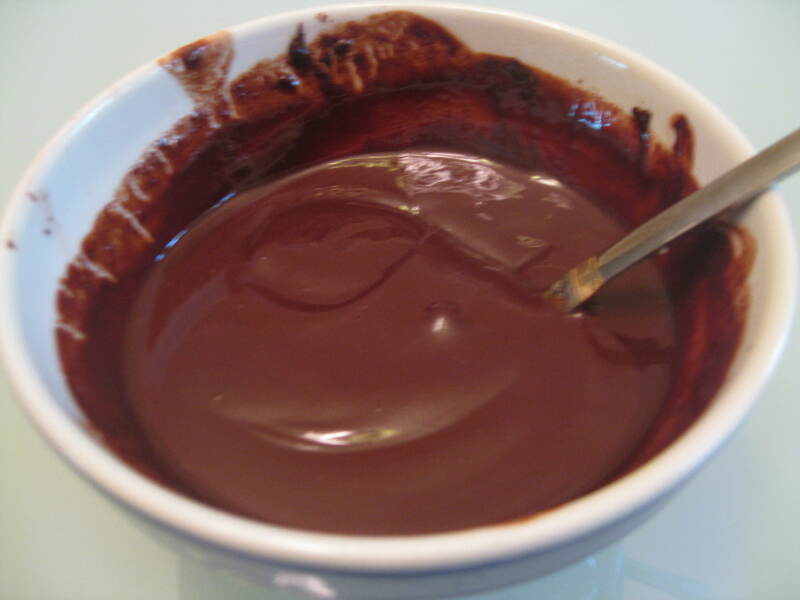 Stir after each 30 seconds until the chocolate is smooth. Should take about 1 1/2 minutes. Set the bowl aside. 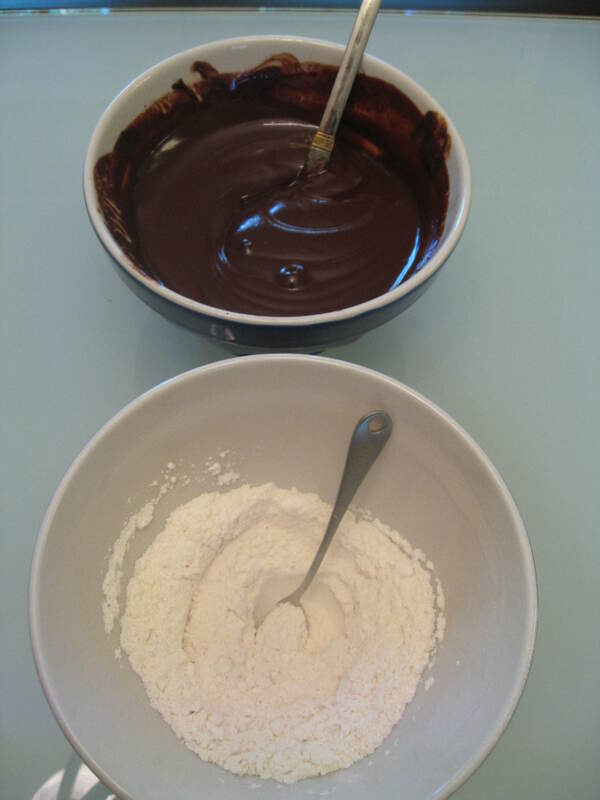 Then mix flour, salt, and baking powder in a small bowl and set it aside as well (I put mine next to each other). In a mixing bowl, beat (at a high, high speed) your eggs and sugar. Beat and beat for about 10 minutes until it is a light color and much thicker than when you started. Then add the expresso powder and vanilla and beat it all up again. Put it next to your other bowls. 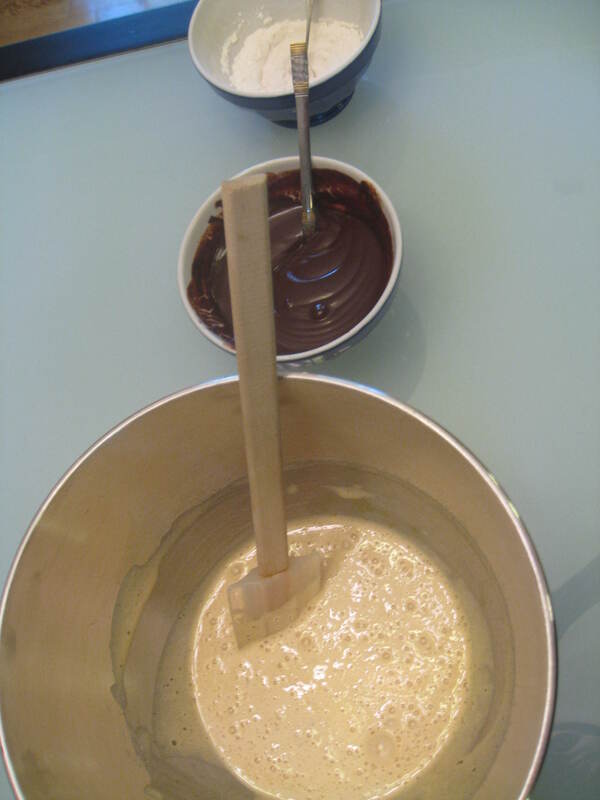 Next FOLD in the chocolate to the egg mixture. Folding means you use a spatula and gently stir it in. 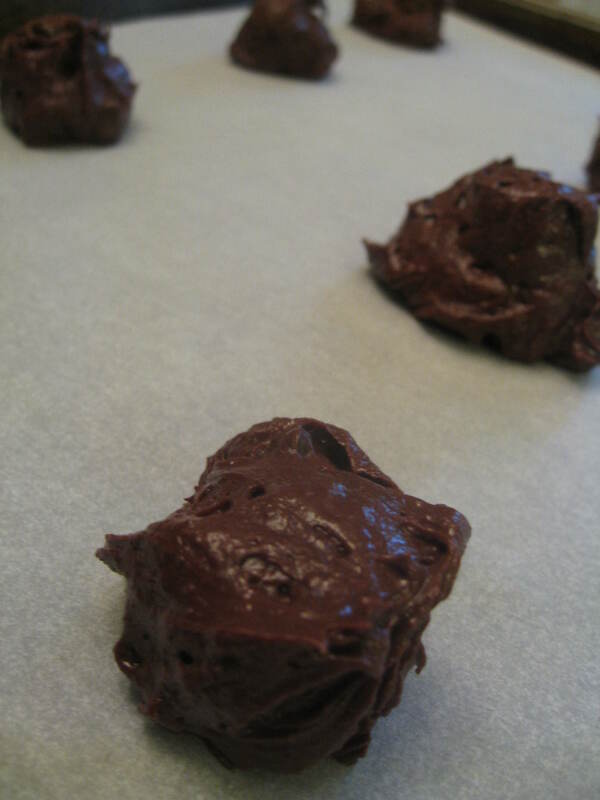 After you fold in the chocolate, fold in the flour and finally the second half of the chocolate chips. 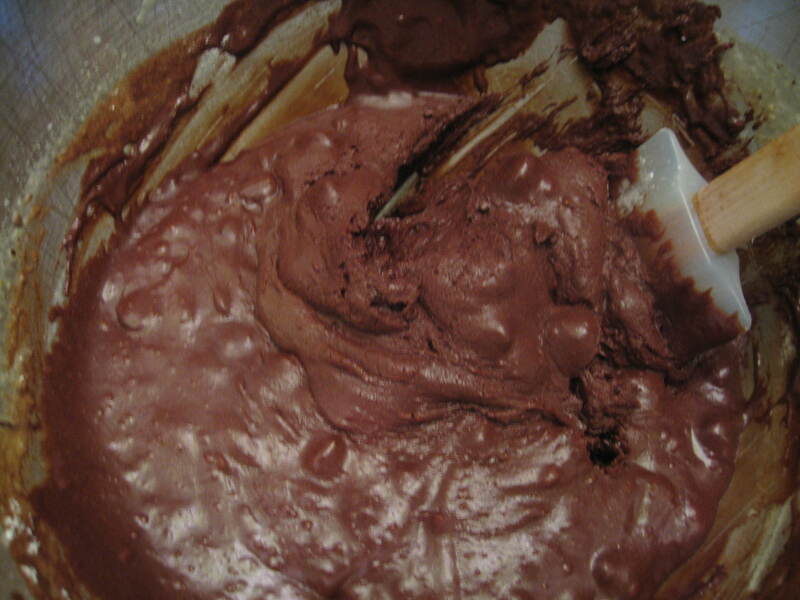 It will then look something like this (resembles brownie batter). Then, the magic happens. Let is sit for 15 minutes. Now is a good time to preheat your oven to 350 degrees. Scoop onto the cookie sheet and bake for 8 minutes. Let rest on cookie sheet a couple minutes and then transfer to a cooling rack. Enjoy warm or the next day. Both are great, but you don’t really enjoy the expresso flavor until the next day.